The Yext Knowledge Engine™ helps your business manage the public facts about your brand everywhere they appear online, facilitating face-to-face and digital interactions that boost brand awareness, drive foot traffic, and increase sales. The Yext Knowledge API allows you to integrate with the products (endpoints) included in your Yext subscription. As you get ready to integrate with Yext via API, here’s a step-by-step walkthrough of our integration process. This guide includes what we require from you and what you can expect from us. 1. Create a Yext Developer Account to test the API integration. 2. While logged in to your Developer Account, go to your Developer Console by pointing to your name in the upper-right corner of the page and clicking Developer Console in the drop-down menu. If you are not sure which endpoints to select, contact your Account Manager or email our API Support team. Be sure to specify the desired functionality. Our team will then load a copy of your production data into your Developer Account. Please allow 3-5 business days for the data to appear in your Developer Account. We’ve listed the data field specifications that are supported by Yext. Your data sent via API must meet these standards. We’ve created a list of required test cases that you need to complete in your Developer Account. We require that you test your data for 5-10 business days to ensure that your integration meets all the cases. 7. When you’ve successfully performed all the test cases and you feel comfortable that your data meets Yext’s requirements, contact your Account Manager to initiate Yext QA. 8. Our Operations team will review the information you’ve pushed to your Developer Account to guarantee that all quality standards are met and that the data is production-ready. This process can take about 5-10 business days, though the actual timeframe may vary. 9. Once our Operations team confirms that your data is production-ready, we’ll ask you to set up your app in your production dashboard. 10. Make the necessary configuration changes on your side to account for the differences between your production account and the Developer account (e.g., API keys, IDs for custom fields). 11. Before the initial push to your production account, you’ll coordinate with our Operations team so they can monitor, catch, and correct any issues that may arise. 12. Once any issues have been resolved, you’ll be live and integrated with Yext! If you have any questions during this process, contact your Account Manager or email our API Support team. 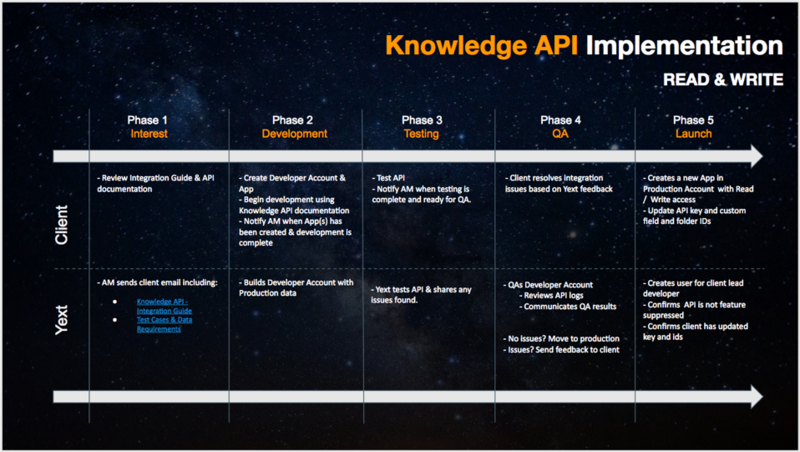 For a complete list of endpoints, see the Knowledge API documentation. The information you need to complete Phase 3 of the integration appears below. TitleMax is one of the nation’s largest title-lending companies. TitleMax is one of the nationâ€™s largest title-lending companies. Provide an institution name under 100 characters in length. Do not provide incomplete education/training data (missing any of the three subfields). Do not provide a yearCompleted before 1900 or after 2100. Do not provide an institution name that is more than 100 characters in length. NOTE: Only changes (deltas) should be sent in PUT Location requests. Location IDs should never change once set. A localPhone value must be provided if the main phone (phone) is a toll-free number or a tracked number. If phone is a tracked number, then set the isPhoneTracked field to true. Create a User under a new customer. For most cases, the User should be assigned the “Location Manager” role. Create a Location with an invalid categoryIds, phone, facebookPageUrl, etc.